Considering the options: Mike Bennetts Z Energy CEO, Hon. Dr Megan Woods Minister for Research, Science and Innovation and Scion’s Dr Paul Bennett. New Zealand could build a renewable low carbon transport fuels industry - but only if we as a nation get our act together. A new report by bioenergy specialists at Scion looks at how New Zealand could grow and process feedstock crops into liquid biofuels targeted towards the heavy transport, shipping and aviation industries. There is no broad consensus on biofuels in New Zealand. This only compounds the difficulties of establishing a new, large, and complex biofuel value chain that involves considerable technical risk, over several decades. 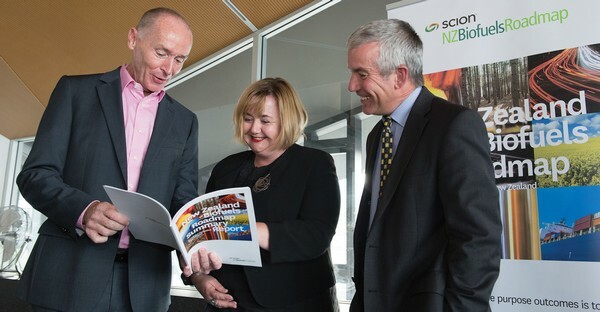 How we might do this and what it could mean for New Zealand in environmental, social and economic terms are some of the questions the Scion scientists behind the New Zealand Biofuels Roadmap study set out to explore. Dr Ian Suckling, technical lead, says the team wanted a way to explore different futures. “We wanted to consider the effects of a wide range of different feedstocks, technologies and fuel mixes. Overall, we set out to come up with alternative futures that would inform and stimulate debate around biofuels, not make recommendations,” said Ian. The sheer number of options available to the team meant they had to carefully consider the scope of the study. After discussion with stakeholders ranging from forest growers to fuel distributors and government organisations, the team focused on the production of liquid biofuels from sustainable feedstocks and not fuels that would require new or modified engines. A second focus was large-scale deployment and use of biofuels. The process of narrowing down options to find a range of the best solutions for New Zealand was done using the Bioenergy Value Chain Model (BVCM). Developed in the UK by the Energy Technologies Institute and modified for local conditions, the model balances multiple considerations to find the lowest cost solutions for potential biofuelled futures. Biofuel substitution at the relatively high level of 30% by 2050 is one possibility. In one future scenario, the BVCM model is given the latitude to use any combination of feedstocks, technologies and final fuel mix to calculate the lowest cost way to achieve 30% substitution. If all land classes can be used to grow feedstock, the model favours existing and new forests, forest residues, canola seed and energy crops like miscanthus and willow, as the main feedstocks. Biodiesel and drop-in petrol and diesel would be the fuels produced. If the land available is restricted to non-arable land, growing and harvesting canola and energy crops is no longer possible and the feedstocks would come from existing and new forests and forest residues. The fuels produced would be drop-in petrol and diesel. The energy crops and forests would be grown mostly in Northland, the East Coast, the central North Island and Marlborough/Nelson, areas where land is available, not too costly and the climate favours growth. Processing would take place in the same areas. The team has run more than 50 scenarios, including looking at the effect of targeting specific fuels like jet fuel, one of the few ways to decarbonise the aviation sector. Specifying jet fuel increases cost as the system becomes less flexible and more expensive processing technologies are needed. However, it is unlikely just one type of biofuel would be produced. Most drop-in in biofuel technologies produce a mixture of petrol, diesel and jet fuel. GHG emissions would be reduced by 5 million tonnes per year (compared with 2015 levels), which would be equivalent to removing half the cars on the road and we would be more energy independent and be able to cut our oil imports by 30%. The regions where biofuel feedstocks are grown and processed would prosper. Considering the non-arable land option as an example, 50% more of the Gisborne area would need to be planted in forests and the area would be home to four pyrolysis and four upgrading plants requiring a nearly $1 billion in capital and creating 1000 jobs. Assuming New Zealand does not wish to use arable land to grow energy feedstocks, new forests would need to be planted. With logs and forestry residue from existing forests and new plantings, a total forest area of around 613,000 ha would be needed. This is about the size of the Taranaki region. A biofuelled future is unlikely to happen by itself. Leadership at a national level is needed. The investment required is large and stakeholder industries will need a degree of certainty when committing to feedstock and processing options. In the meantime, New Zealand should keep exploring short term, niche opportunities for biofuels. Early wins will start to build momentum, create a positive perception of biofuels and develop the country’s regulatory environment. With the right will, Scion’s study and the Bioenergy Value Chain Model, New Zealand can now explore different options and plan the way forward to a sustainable future.